Graveside service with full military honors for retired Sgt. 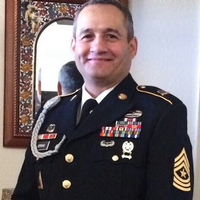 Maj. Pablo Serrano, 56, of Killeen, will be at 10 a.m. Thursday at Central Texas State Veterans Cemetery. Mr. Serrano died April 1, 2019, in Killeen. He was born Aug. 8, 1962, in the Bronx, N.Y.
Chisom’s Family Funeral Home in Killeen is in charge of arrangements.